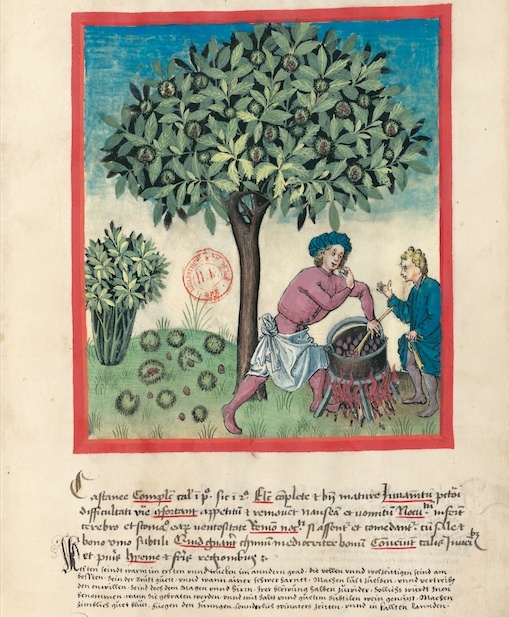 In the late Middle Ages, princes and the powerful learnt the health and hygiene rules of rational medicine from the Tacuinum Sanitatis, a treatise on well-being and health widely disseminated in the 14th and 15th centuries. The treatise, originally known as Taqwin al-sihha, was written in Arabic by Ububchasym de Baldach, or Ibn Butlân as he was also known, a Christian physician born in Baghdad and who died in 1068. In short, everything that contributes to a person’s physical and emotional well-being and which, when well balanced, ensures health and when imbalanced, illness. Ibn Butlân’s “tables of health” were translated into Latin in Palermo, at the court of Manfred, king of Sicily from 1258 to 1266, under the title of Tacuinum Sanitatis. In the late fourteenth century, in Lombardy, a highly developed series of illustrations was incorporated into this treatise, the starting point for a series of copies that spread beyond Italian frontiers. Every page is illuminated with a miniature and a legend stating the nature of the element depicted the characteristics of what is deemed best for human health, its benefits, any harm it may cause and the remedy for such harm. Chestnuts. Nature: hot in the first degree, dry in the second. Optimum: whole and very ripe. Benefit: for the chest and urine problems, they whet the appetite and cure nausea and vomiting. Harm: they damage the brain and stomach with flatulence. Remedy for harm: if roasted and eaten with salt and good, light wine. Effects: reasonably good food. Advisable for hot temperaments, young people and children, in winter and in cold regions. Not only do we find these elements in their natural environment, but we can also see them once they have been picked and presented for sale. At the confectioner’s, full of colored vessels and shining glass jars, are delicious pine nuts with a spiced sugar coating, one of the sweets most popular in the Middle Ages. Also on sale are dried fruit and nuts, figs and raisins, particularly the “large raisins from Gerasa” that Ibn Butlân recommended old people eat in winter since “they are effective against intestinal pain, strengthen the liver and the stomach, and if they burn the blood, this can be remedied with lemon” (f. 54).